Jun Qiu is originally from China, where she grew up and received a bachelor degree. She also has a M.S. in Accountancy from University of Illinois at Urbana-Champaign and has been invited to the international honor society Beta Gamma Sigma. Prior to law school, Jun worked in a real estate company as an accountant and became a licensed CPA in Illinois and an affiliate of Association of Chartered Certified Accountants in the UK. 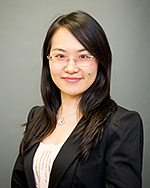 With an interest in corporate law, during her 1L year, Jun served as a 1L Representative for Chicago-Kent's Corporate Law Society and took the elective course Business Organizations through Chicago-Kent's unique 1L Your Way program. Jun is active in and outside of school in various groups: she is the President of Asian Pacific American Law Student Association, participates in Women's Bar Association of Illinois Leadership Institute, serves as Editor of the Newsletter Committee and Co-Chair of Law Student Outreach Committee in WBAI, and volunteers in many events. Jun spent her 1L summer working at Grant Thornton's Tax Practice Policy & Quality department as a legal intern. She enjoyed and benefited from this experience so much that she created Tax Law Society at Chicago-Kent once she returned to school and served as President. In her free time, Jun enjoys dancing and photography, as well as cooking and baking.